Throughout the country, nursing home abuse has become a widespread problem that is just now becoming part of the nation’s consciousness. It is estimated that only 16 percent of actual nursing home abuse are ever properly reported, meaning that millions of our elderly patients suffer from abuse or neglect without any governmental intervention. In Oregon, there are also specific problems that nursing homes struggle with on a recurring basis. A University of California-San Francisco research study revealed that over 30 percent of nursing homes were caught in dispensing unnecessary drugs to patients in 2008. This means that patients may have been consuming drugs with sedative effects for punishment or due to the sheer laziness of nursing home workers. An overwhelming 63 percent of nursing homes failed to provide the quality of care that has been subscribed under federal and state nursing home laws in 2008. 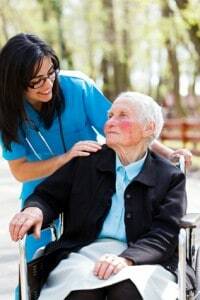 If you believe that your loved one has suffered adverse effects from unnecessary drugs or other forms of Oregon nursing home negligence, then it is time to speak with a nursing home lawyer today. Medicare routinely collects information through surveys, investigations and inspections of every Oregon nursing home throughout the year. The federal agency recently identified thirty (22%) of the 137 Oregon nursing homes had serious violations and deficiencies and now deemed these homes to be below average because the nursing staff provides residents substandard care. Was your loved one was neglected, abused, mistreated or died unexpectedly while residing in a nursing facility in Oregon? 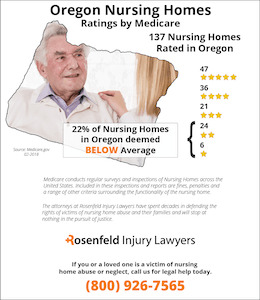 If so, we encourage you to contact the Oregon nursing home abuse & neglect attorneys at Nursing Home Law Center to discuss a claim for compensation during an initial, free case consultation. 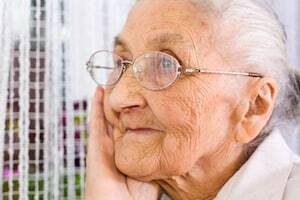 The Elderly Persons and Persons with Disabilities Abuse Prevention Act is a clear prohibition on the neglect, abuse and exploitation of elderly people in Oregon. This Oregon statute goes to great lengths to provide many examples of what constitutes “abuse” under the Act. Any physical injury, neglect in withholding medical services, infliction of pain or injury, sexual contact with a non-consenting individual and the use of verbal abuse are all considered to be forms of abuse under the statute. If one is aware of abuse that has impacted an elderly person in 180 days preceding the injury, then he or she may petition the circuit court for an injunction. In this scenario, you may wish to get in touch with a nursing home lawyer who can help you in the petition process. It may be possible to place your loved one in an alternate facility that will treat him or her with the care and protection required under the law. The Oregon Act also outlines the different steps that the court can take to protect a loved one. These different steps may include prohibiting a nursing home administrator from exercising continued control over funds, a refund of payments to a nursing home facility and subjecting nursing home workers to a thorough investigation. Family members have every right to file a report of abuse or neglect when they suspect that it is impacting a loved one. It is vital that family members move forward and not allow nursing home administrators to intimidate them in the process of filing a report. Nursing home lawyers are available to serve as legal support and a source of strength in standing up for the rights of a loved one in a facility. Our lawyers will investigate Oregon nursing home negligence and can also figure out the appropriate damages to request in your case. Developing a bedsore can happen quickly whenever a wheelchair-bound or bedridden individual remains in one position for too long. The weight of the body can put pressure on a specific area, restricting oxygen-rich blood to the skin. The skin and surrounding tissue can easily become inflamed after just a few hours where red spots and tiny blisters can develop. Pressure sores (bedsores; decubitus ulcers; pressure ulcers) require immediate treatment by medical staff specifically trained to handle these types of wounds. Bedsores happen all too often in nursing facilities throughout Oregon. This is because many times the nursing home staff does not properly reposition mobility-challenged patients who lack the capacity to turn or adjust themselves without assistance. Bedsores are usually a sign of negligence in facilities with insufficient staff or nurses and nurse’s aides who lack the training necessary to follow proven protocols. 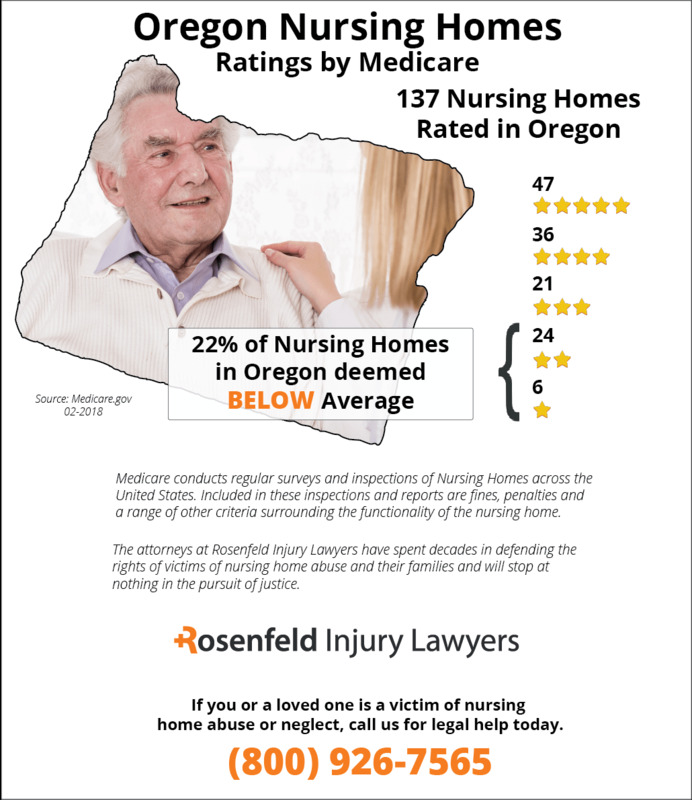 When it comes to holding nursing homes and hospitals responsible for the development of pressure sores on patients, you can count on our Oregon nursing home negligence attorneys to hold the facility fully accountable. We invite you to contact our office for a free case review today. A pressure ulcer is easy to detect on the patient’s skin. Because of that, it is essential that the nursing staff inspect the skin of the patient from head to toe at least one time at the beginning of their shift. In its early stage, the appearing wound will feel softer or firmer, and warmer or cooler, when compared to the surrounding tissue. The nurse must make notations in the patient’s chart, alleviate pressure to the area and contact the attending physician to begin treatment. Any progression of a developing bedsore in its early stage is a sign of negligence by the medical team. As the bedsore progresses to an advanced stage, a shallow crater begins to develop at the affected site. Without treatment, the shallow crater can deepen to the point where bone and muscle are exposed, leaving the wound open to serious life-threatening infections of the bone (osteomyelitis) and blood (sepsis). Every nursing home in Oregon is responsible for following state and federal regulations to provide the ultimate care for each patient in the facility. Whenever a patient develops a bedsore, it is often the result of the failure of the nurses’ duty to provide quality care. When negligence is involved, the facility must be held legally accountable. This is because negligence is typically the main cause of every bedsore acquired in a nursing facility. Unfortunately, pressure sores are one of the leading underlying causes of patient deaths in nursing homes. Bedsores are usually due to the lack of properly trained medical staff or facility without adequate staffing to ensure that all the health, hygiene and nutritional needs of every patient are being met. Fill out the form here to schedule a free initial consultation with an Oregon nursing home abuse lawyer listed below. These law firms can accept your case on contingency to help you stop the negligent actions of the nursing facility today. They can assist you in filing a case or lawsuit against all parties responsible for the negligence that caused your loved one injury.